Venezuela is at a tipping point. Under the devastating socialist dictatorship of Nicolas Maduro, Venezuelans have no food, medicine, or opportunity. But recently, hope has sprung, and Venezuela’s people have a chance to oust Maduro and his regime for good. Today, Sen. Marco Rubio, R.-Fla, will speak at an event hosted by The Heritage Foundation and the International Republican Institute to discuss the latest political developments in Venezuela, Interim President Juan Guaidó, and next steps for U.S. policy. Watch the event live and listen to this week’s “Heritage Explains” podcast to get up to speed on the evolving crisis. Congress’ border security deadline is approaching. Lawmakers are working on a bipartisan border security plan this week in order to avert another government shutdown. President Trump’s short-term spending bill expires Feb. 15. During his State of the Union address last week, Trump said he would send a “commonsense proposal” to end the crisis on the southern border that includes not only humanitarian assistance, but “more law enforcement, drug detection at our ports, closing loopholes that enable child smuggling, and plans for a new physical barrier or wall to secure the vast areas between our ports of entry.” Hans von Spakovsky, a senior legal fellow in Heritage’s Meese Center for Legal and Judicial Studies, said, “These are exactly the kinds of actions that need to be taken to remedy our border problem.” Read more analysis from Heritage experts on Trump’s State of the Union address. The Green New Deal is a raw deal for the American people. Rep. Alexandria Ocasio-Cortez, D-N.Y., and Sen. Ed Markey, D-Mass., released their mega climate and energy initiative called the Green New Deal last week. The bill aims to fundamentally transform how people produce energy, harvest crops, raise livestock, build homes, drive cars, and manufacture goods. All within 10 years. “We all want clean and affordable energy to fuel our economy and improve our lives,” said Nick Loris, Heritage’s Herbert and Joyce Morgan fellow. “But the so-called Green New Deal would make energy unaffordable and devastate the economy, hitting working-class Americans the hardest.” Loris also says the deal would produce no meaningful climate benefit. Read Loris’ commentary for more facts on the Green New Deal. Examining mental illness, firearms, and violence. Thursday marks the one-year anniversary of the horrific shooting at Marjory Stoneman Douglas High School in Parkland, Florida, that killed 17 students and staff members. Since the shooting, lawmakers across the country have been working to find a solution to make our schools safer. Heritage recently released new research that examines the intersection of mental illness, violence, and firearms. “We must ensure that policy decisions regarding Second Amendment rights reflect an accurate understanding of the role mental illness does and does not play in gun violence, as well as an accurate understanding of why the United States is suffering from a crisis of untreated serious mental illness,” write Heritage experts John Malcolm and Amy Swearer. Read the new report and check out Heritage’s School Safety Initiative. This week on the “Heritage Explains” podcast, Ana Quintana, a senior policy analyst in Heritage’s Allison Center for Foreign Policy Studies, explains the latest situation in Venezuela, and the proper role the U.S. and the international community should have. Listen to the podcast. Monday at 11 a.m., as part of the speaker series on “Free Markets: The Ethical Economic Choice,” Edward Feser, a professor of philosophy at Pasadena City College, will discuss the inherent opposition between socialism and the traditional family structure. Watch this event live. Monday at 2:30 p.m., Sen. Marco Rubio, R-Fla., will join the International Republican Institute and The Heritage Foundation to discuss the crisis in Venezuela, the interim presidency of Juan Guaidó, and the next steps American policy should take to insure a peaceful transition of power. Watch this event live. Tuesday at 11 a.m., Heritage will host an event discussing “Putinomics.” When Vladimir Putin first took power in 1999, he was a little-known figure ruling a country that was reeling from a decade and a half of crisis. In the years since, he has re-established Russia as a great power. How did he do it? This event will feature author and speaker Chris Miller, assistant professor of international history in the Fletcher School of Law and Diplomacy at Tufts University. Watch this event live. Wednesday at noon, Heritage will host an event with Stephen Hess, a senior fellow emeritus in governance studies at the Brookings Institution, to discuss his memoir “Bit Player” about business, politics, and everyday life in the old guard establishment of Washington, D.C. Watch this event live. Thursday at 11 a.m., Heritage will host Elizabeth Neumann, assistant secretary for threat prevention and security policy for the Department of Homeland Security, to discuss the threat of domestic terror to the United States and the measures government should take to prevent attacks. Watch this event live. David Azerrad, director of Heritage’s B. Kenneth Simon Center for Principles and Politics and AWC Family Foundation fellow, joined Fox News’ “Tucker Carlson Tonight” to discuss the destructive power of identity politics and its threat to the unity of American culture. Watch the interview. Klon Kitchen, a senior research fellow in Heritage’s Kathryn and Shelby Cullom Davis Institute for National Security and Foreign Policy, appeared on Fox News’ “Special Report with Bret Baier” to discuss the growing concern of deepfakes and how they would affect the 2020 election. Watch the interview. Peter Brookes, a senior fellow of in Heritage’s Douglas and Sarah Allison Center for Foreign Policy, appeared on Fox Business’ “The Evening Edit,” to talk about the latest news from Venezuela and on Fox News’ “America’s News HQ” to discuss the U.S. withdrawing from the INF Treaty and how Russia has been cheating on the agreement. Riley Walters, of Heritage’s Center for Asian Studies, joined Fox Business’ “FBN:am” to talk about the latest in the U.S.-China trade talks and the possibility of reaching a deal with the Chinese. Watch the interview. Genevieve Wood, a senior adviser and Heritage spokesperson, appeared onFox Business’ “FBN:am” to react to the State of the Union address. Watch the interview. 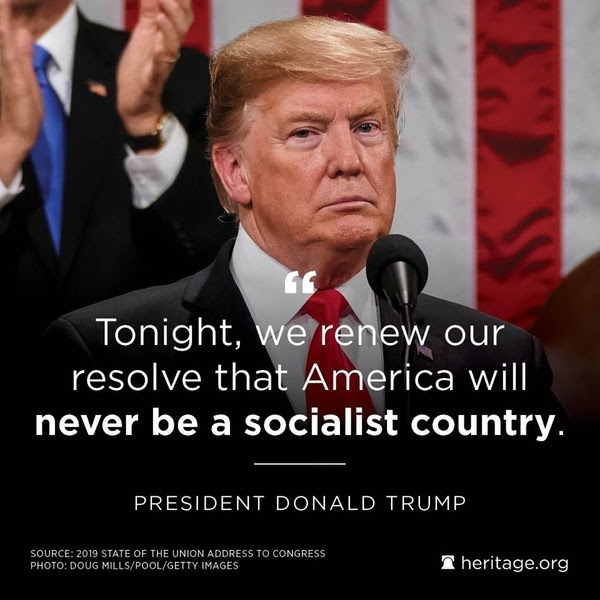 Romina Boccia, director of the Grover M. Hermann Center for the Federal Budget at The Heritage Foundation, appeared on CNBC’s “Closing Bell” to discuss Trump’s comments on the economy and socialism at the State of the Union. Watch the interview. Bruce Klingner, a senior research fellow in Heritage’s Asian Studies Center, joined Fox News’ “Special Report with Bret Baier” to talk about the upcoming Trump-Kim summit. Watch the interview. Share this image on Facebook and read our analysis of Trump’s policy proposals in his State of the Union address. The Heritage Foundation is America’s most broadly supported policy organization. Your gift will advance your conservative principles of free enterprise, limited government, individual freedom, traditional American values, and a strong national defense. Donate now.